BENSALEM, PENNSYLVANIA, U.S.A. It was Friday morning at work. I was sitting there staring at the computer deep in thought. We are a family in the very beginnings of a transition. There is something good happening. I know it is of the Lord. But for some reason I was just not myself. I was holding my hands out in front of me just checking to see if they were still steady because sometimes they aren't. They were steady this time. The date was September 24th. Our 29th wedding anniversary was coming up on Sunday. I was remembering what had happened on the 24th way back in 1981. I was 33 years old. My wife to be was 27. I was sitting in my office, my Fort Devens, Massachusetts office, back then too. For me, back then, what I was about to do was a 'til-death-do-you-part-type thing. That was a bit scary to say the least. I also had not known whether staying in the military was what I should do after we were married. That question had been up in the air along with everything else. Then, back then, something happened. We had originally scheduled our wedding for October, but then I came down on orders for language school so we happen to choose September 26th as our new wedding day. We didn't know at the time but that same day just happened to be the 40th anniversary of the Military Police Corps of which I was a part. Thinking about that "coincidence" that day made me feel the same way I was feeling on the same date 29 years later. Back then something had come to my heart and mind. This was a way that the Lord was showing me that the lady I was marrying was the right one and also that we would stay in the military. From the joy, the unspeakable joy, caused by that God-given peace about this major step in my life, came a special kind of writing on that day in 1981. Caretakers of the Colors was what the title of it was. That piece of writing and the story behind it is here at our web site. But what was happening this 24th of September, 2010? Why was I feeling this way again? The previous weekend I had spent a bunch of time with my son AJ at a conference at his church. The speaker for Friday night and Saturday morning was Tullian Tchividjian, pastor of the Coral Ridge Presbyterian Church in Florida and grandson of Billy Graham. The time under his teaching and some other teachers, professors from Westminster Theological Seminary, had brought out some realizations of what I felt the Lord wanted me to do with the next thirty years of my life with the help and added guidance of my wife. My son AJ is also going through a kind of transition himself so the time was meaningful for both of us. So here I was, on Friday morning the 24th of September, 2010. For some reason I was very unsettled about what the day was going to bring. So I turned around to my desk and began to open the morning paper, the Bucks County Courier Times. I usually read the editorials at the end of the first section first. But as I separated that first section from the rest of the paper, there in front of me was the front page of the local news section. And there in the center of that page was a picture that was so big that it was impossible to miss. It was a picture of my son, AJ, running for all he's worth. 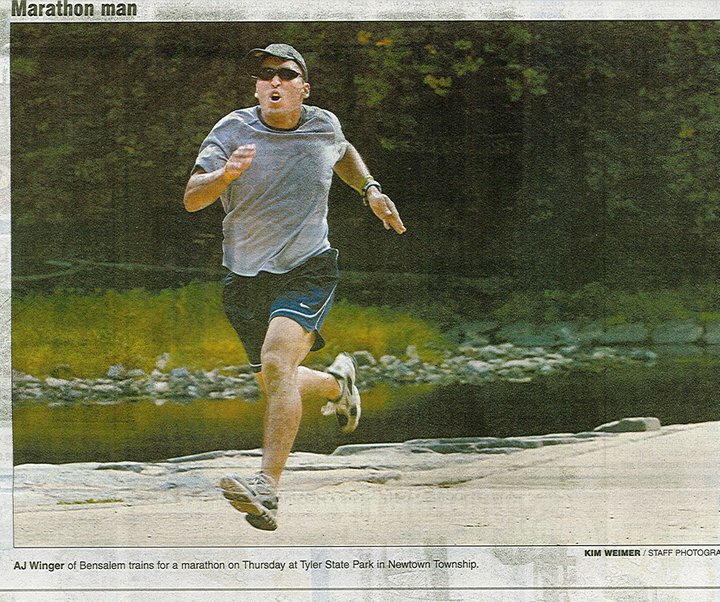 The title of the picture was Marathon Man. The caption underneath read, "AJ Winger of Bensalem trains for a marathon on Thursday at Tyler State Park in Newtown Township." BAM!!! I hit my fist on the top of the desk and yelled out, "Yes!! Yes!! Yes!! Wow!!! Praise the Lord!!" I could not contain myself!! He had told me the night before that he had had his picture taken by a photojournalist from the paper. He had said that he was right at the end of his run, going as hard as he could, and that he had spotted this lady taking a picture of him. Kim Weimer, the photojournalist had identified herself and asked if he was in training for something. He had told her that he was preparing for the Philadelphia Marathon in November. She had asked him how long it was and he had told her that it was 26.2 miles. He said that she was impressed. But you know how it goes. Sure he had his picture taken but the chances of it actually showing up in the paper...well...you just don't really expect those kinds of things to happen. So here I was, sitting in my office. I'm supposed to be working my normal routine. But instead I'm going out the door and getting in the car. I'm driving down to the closest gas station where I know they sell the paper, and I'm buying all the copies they have. Then I'm driving home because I know my wife is there and probably my son as well. My wife is there and I give her a copy of the paper. She is flabbergasted of course. AJ is not there and I figure he's probably up at the fitness center at the school. But before I go back to the school, where I also work, I go to my daughter's job to give her a copy. I tell her, "Ya know Ruthie...29 years ago something special happened on this date and you know the writing that came out of it which was very special. I just want you to know that both you and your brother are my heroes and I thank God everyday for ya'll." I gave her a hug and went out the door. I found AJ in the fitness center and gave him the paper. Some of his friends there had already seen the paper and had told him about it but you could tell he loved that picture. I told him the same thing that I had told his sister, also adding that I was very proud of him, and then I pulled myself away. I did have to work that day. But it seemed that the whole day was one where I was just bubbling all over and couldn't stop showing this person and that person the picture and bragging about my son. Not too much longer in the day Ruthie had scanned the picture at work and it was up on Facebook for all to see. And the comments from family and friends began rolling in. At the end of the work day I took a copy of the paper over to the friend of mine that runs the fitness center. I said as I was walking in, "Tom, do you need a motivational picture for your new fitness center?" He looked at the paper, immediately took some scissors out of his desk, started cutting out the picture, and with a big grin on his face said, "I know EXACTLY what I'm going to do with this picture! Man, he's running flat out in that picture. He's going for all it's worth!" Later I would read an article on the internet about Kim Weimer the photojournalist from the paper. The author had written that "Effective photojournalists interpret, rather than record, the news by expressing values that all of us share as human beings...Human values are expressed through gesture and body language, and Weimer is masterful at finding that moment in light, time and space that conveys human response as symbols of the values we share." Philip N. Douglis. "Effective Photojournalism Interprets Events Through Human Values." Communication World, Oct-Nov 2002. Acquired 26 Sep 2010. LANGHORNE, PENNSYLVANIA, U.S.A. Today is September 11th 2010, the ninth anniversary of an event that changed us as individuals, as families, as places of worship, as communities, as a nation, as a world. We cannot turn back the clock. We honor those who were at the center of our lives for a time, those who were in the middle of the event that occurred that day, and those who heard the call for help and responded. We honor them as much as we honor those who have heard the war tocsin sound and who have responded to that call as well. Some paid the ultimate price. Others live with the scars of responding to that call. The tapestry of which we are one continuous thread is rich in color, strong in character, and espouses a sense of freedom that is unequaled. We live in a world of pain and suffering and hard times. But we also live in a world full of joy and blessings and people who care about each other and reach out to those in need. For we say to ourselves, through our faith, "There but by the grace of God, go I." For those who know even an inkling of a faith that sustains them, let this day be one of prayer first and foremost. Yes, a spirit of patriotism should also ring loud and clear on this day. But right along side, coexisting in parallel and going in the same direction, can we pray in the way that we were taught to pray, whether the teacher was those who raised us from birth, or someone else along the way who in someway mentored us into the persons that we have become? Can we pray as we were taught? Can we pray for peace? Can we pray that something like this will never happen again? Can we pray that we would be good mentors to the next generation? Can we pray for a world that needs prayer? Can we pray for those who lead us at whatever level that may be? I think we can. I know we can. For in our freedom it is not just what we are free to do. It has also become what we have learned that we are free not to do. We should be thankful for that. And for those of us who have even an inkling of faith in our lives, we have always known that prayer is a good thing and to not pray is just not a path that we should ever think of following. Will you pray with me today? And for those who have already made this day one of prayer, thank you for allowing me to join you in that oneness of spirit.